"The Coming of the Toa"
Today's post is a special one. Not so much for the content, but for the fact that this is my first sorta-kinda blogger team-up. 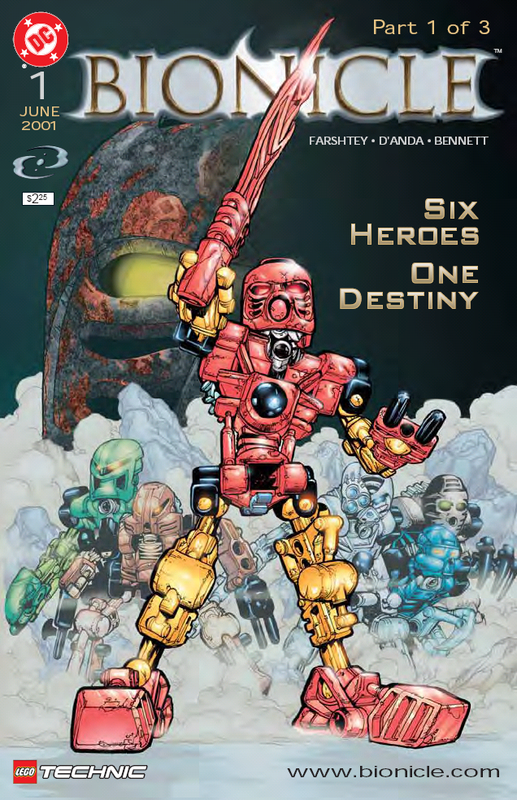 Good buddy Mike Carlyle over at The Crapbox of Son of Cthulhu is also running a Bionicle piece today! The main difference is that his is quite a lot more fun to read than mine, so definitely check his out! It's daybreak on a desolate beach. A pod begins stirring with a hiss of steam and an electronic current before cracking open. A white-masked robot emerges from the wreckage, holding a sword and shield. It is on this island for a reason, it is here to dispense justice! Working it's way deeper inland, our robotic bud notices he's (I think I'm just gonna say "he") being watched. The observer is a more diminutive robot, who upon discovery attempts to flee. He is unsuccessful due to the icy ground... wait, I thought we were on a beach? Okay, no matter... I'll just assume he's been walking a real long time. The observer introduces itself as Matoro, he claims to be a Tohunga and tells our main bot he is currently on the island of Mata Nui. Matoro has long awaited this arrival, and also claims that there are "others" and the Kanohi "masks of power". Our bot, who is still unnamed, asks where he may find these masks of power. Matoro explains that they are scattered and guarded by Nightmare Creatures. He continues by claiming that village elder Turaga Nuju knows the whereabouts of the Mask of Shielding. They reach a large chasm where a bridge will someday be. As they look on, a Green robot smashes into them knocking them into the fissure. Matoro refers to our white-masked friend as Kopaka, so I suppose at some point off-panel they shared a bit of introductory pleasantries. As they descend, a blast from Kopaka ensures their safe landing. The Green creature is referred to as one of the Nui Rama. On solid ground, our robo-duo run into village elder, Turaga. He claims to know who and what Kopaka is. Kopaka being the Toa of Ice apparently wields the power of winter itself! 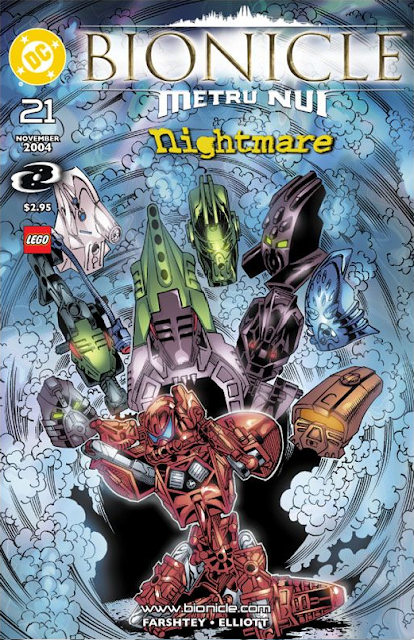 A threat is introduced in the evil Makuta, and we are given a link where we can receive a crash course in Nuju-speak (which as of this writing is a redirect to the main Lego Bionicle homepage). As they continue their discussion, an avalanche occurs. Kopaka finds that he has been buried by the Toa of Stone, Pohatu. The two share a contentious introduction, and begin to scale a mountain. Pohatu asks if Kopaka would be down for a team-up, to which 'pak says he "works alone". Mike and I have been trying to coordinate something of a partnered post for the past few weeks now. When I found out that he was going to run a Bionicle piece, I jumped at the opportunity to take part. I knew I had at least one issue of this series, the first issue was a giveaway, right? Ri--... What? I PAID for this thing? This was from a time before I discovered the magic of the quarter-bin... and from a time where I was, err... I think the scientific term is "willy nilly" with my money. I cannot believe I plunked down two-and-a-quarter (plus tax) for this thing. But sadly... I'm sure I did. I was an easy mark back in the day. In fact, I would pretty much just buy whatever the shop owner threw in my box. I was of the mind that he was actually making suggestions, rather than throwing whatever he ordered too much of into subscription boxes in hopes that the box-holder would A) Not notice, B) Decide to try it out, or C) (C is for Chris here) Would feel a bit too guilty about putting it back on the shelf, and just sucking it up and buying it. I have quite the collection of turn-of-the-century garbage that I felt too guilty about leaving behind, lemme tell ya. Anyhoo... thoughts. This was one of the more uninviting first-issues I've ever read. Every panel appeared to be an expository info-dump full of Bionicle-speak-lingo. I haven't been this confused by an in-story language since the first time I fired up Final Fantasy XIII. What's a Toa? Who or what is a Makuta? Is Turaga a name, or a type of bot? It's just too much... I have all of these questions, yet I'm still not interested enough to pursue the answers. The art is nice, though somewhat hard to follow at times. The main two robots we follow are the same color, and during action scenes it is somewhat difficult to tell them apart. The rescue scene prior to the chasm incident is especially difficult to follow... the bots looked, for lack of a better term, squiggly. This would likely be something of a treat for someone who also collected the toys, however, for a simple comic book guy like myself... it's no fun at all. For some actual fun, make sure to check out Mike's take on Bionicle #21 from the Metru Nui saga (November, 2004). Live today from the Crapbox of Son of Cthluhu! Woah! Yours had a non-Bionicle advertisement in it. Score, Dude! Oh crap! Jeebus. You paid full price for a book of Lego ads. I'm sorry man.